The IBSA People-to-People Fora reflect the interest of the three Member States in improving interaction and relations between Government and grass-root levels so that IBSA is not only restricted to Government efforts. The Fora meetings take place on the margins of the IBSA Summits. During the Summit, the respective Chairs of the Fora are given the opportunity to report on their work progress to the IBSA Heads of State/Governments and also assist the Dialogue Forum by proposing new direction or areas to be further explored in the Dialogue Forum. This serves as a platform for engagement between academics in higher education based on the IBSA Memorandum of Understanding (MOU) on Cooperation in the field of Higher Education which was signed on 17 October 2007. This MOU identified the following areas for cooperation: engineering, computer science and mathematical sciences; bio-technology, agriculture and livestock; sustainable development; social transformation and empowerment and higher education studies. An Academic Forum Concept paper has also been developed to guide activities. It is intended to harvest the joint intellectual capital of the three countries in order that they develop knowledge based solutions, in particular for problems of the South. The IBSA research mobility fund has been implemented and has led to a number of collaborative projects assisting in strengthening research cooperation between the three countries. The IBSA Business Forum deliberates before Summit meetings with the objective of advancing mutually beneficial trade and investment between the three IBSA States. At the last meeting numerous recommendations were made to the Summit across the following five sector focus groups: Healthcare and Pharmaceuticals; Agriculture and Agro-Processing; Financial and Business Services; Mining and Infrastructure and Energy and Climate Change. 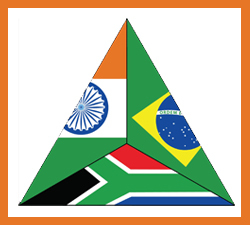 The Tri-Nations Summit on Small Business was established in 2006 and is a partnership between the key institutions of India, Brazil and South Africa that are tasked with implementing the small business development policies of their respective countries. These institutions are the Brazilian Micro and Small Business Support Service (SEBRAE); the National Small Industries Corporation (NSIC) of India and the Small Enterprise Development Agency (SEDA) of South Africa. The main areas of cooperation include the promotion of access to technology and innovation, the exchange of knowledge and best practice and the promotion of access to markets for small enterprise. The first Conference of Editors was held in India in September 2007. The objective of the Forum is to analyze the development and cooperation in the area of media and communication in the three countries, and strengthen the developing countries' contribution in the international media scene. The objective of the Local Government Forum is to consolidate support for programmes that promote sound local governance and to ensure that knowledge and experiences relevant to local government are shared between the three countries. The Forum was first held in 2007, on the sidelines of the Second IBSA Summit, in South Africa. One of the objectives is to enable the exchange of information on the operation and the parliamentary agenda in IBSA countries. This Forum will also assist the IBSA Parliaments in sharing experiences and building contact between the three countries’ Parliamentarians. The establishment of this Forum in 2007 was to enable the voices of women in IBSA to be heard and to ensure more focussed attention on women’s issues and empowerment. On15 October 2008, a MOU was signed in New Delhi, India on cooperation in the field of women's development and gender equality programmes.